On a recent trip to Australia, I made a bit of a discovery. I’d always thought that the Grampians, an area of sandstone ridges and waterfalls in Victoria, had the best walking trails in the country. While they still have a special place in my heart, step forward, Tasmania. Backwoods Tasmania is a land of glaciated valleys, barren highlands, temperate rainforest and sheltered coves on sand isthmuses. You can embark on strenuous day or multi-day hikes in Lake St. Clair National Park, a wilderness so unspoilt it has World Heritage Status, or a short stroll on the deserted, white-sand beaches of the Bay of Fires. Despite all this, Tasmania’s national parks receive much less footfall compared to national parks in the USA, or other parts of Australia. Tasmania has 19 national parks, which offer numerous walking routes, but two areas particularly stand out for me:Cradle Mountain and the Freycinet Peninsula. Cradle Mountain and surrounding trails. Cradle Mountain – Lake St. Clair National Park is a region of eucalyptus forests, glacial lakes, mountains and moorland that resembles Scotland. It’s brilliant for walking. Not only are all the trails well marked, there are routes of varying lengths that give you different perspectives of the park, with no need for a guide. I combined several routes to create an eight-hour day of both gentle and demanding hiking. The fun began the night before as I drove to Peppers’ Cradle Mountain Lodge, my base in the park. 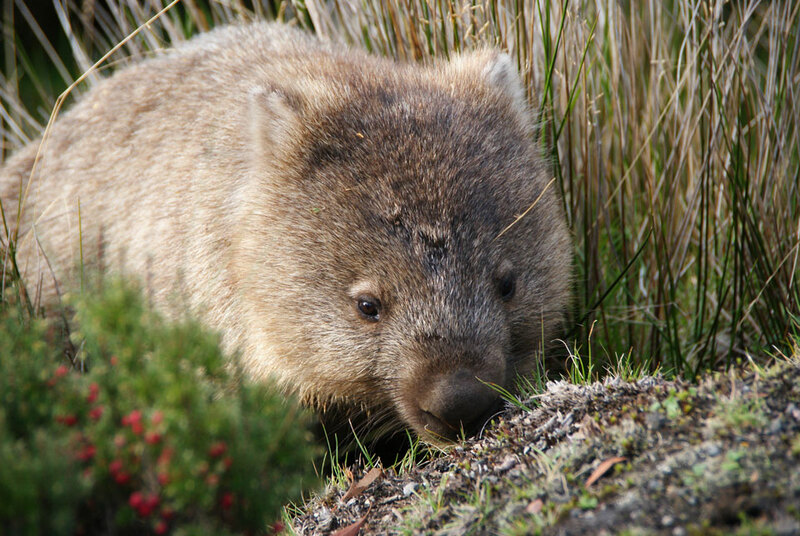 I saw a shape ahead and pulled up: a wombat was trotting across the road, oblivious of my vehicle and I. The next day I started out at 7am, catching the free shuttle bus that runs from Cradle Mountain Visitor Centre to Dove Lake car park, the starting point for most of the park’s paths. It was crisply cold at that time in the morning – around 2C. I saw my breath misting in the air as I made my way around the low-level Dove Lake Circuit, gazing out over the water to the saddle that gives Cradle Mountain its name, and the jagged dolerite columns that stand sentry either side. Like many of the trails in this national park, much of the circuit is boardwalk. Although there are several steeper, stepped sections, it’s mostly a moderate route that’s accessible to walkers of all ages and fitness levels. The circuit takes you through gum forest surrounding the lake, where the springy moss coating the tree trunks and carpeting the forest floor gave me the impression of an enchanted, long-forgotten land. Other trails took me past Wombat Pool, whose millpond-like waters are the colour of tea, and up to the alpine plateau of Marion’s Lookout. This route also lets you experience part of the Overland Track, an epic six-day wilderness trek from Cradle Mountain to Lake St. Clair, Australia’s deepest lake. The going got much harder on the Cradle Mountain summit climb. The higher I went, the fagus and pencil pines began to thin out. The vegetation became more and more sparse and gave way to scrubby heath until we reached the exposed scree of the peak. Getting to the actual summit involved a bit of bouldering and a hand over hand scramble, and should only be attempted by the sure-footed. The panorama from the summit comes into full view once you’re right at the very top. You can look out over Dove Lake and almost the entirety of the national park, including Mount Ossa, Tasmania’s highest peak at 1,617m (5,305 feet) above sea level. One of the pleasures of walking in Tasmania is its beach walks. I had a great time roaming alongside the bright orange-hued rocks of some of the more secluded beaches in the Bay of Fires, and it’s possible to do a longer, four-day guided walk to explore the area thoroughly. But when it comes to vigorous coastal walking in Tasmania, the highlight was the Freycinet Peninsula in Freycinet National Park. The granite outcrops of the Hazards Mountain Range tower over this thickly forested peninsula, full of coves and rocky promontories. Setting out from Freycinet Lodge, where all trails on the peninsula begin, I first climbed up to the Wineglass Bay viewpoint. It’s steep, but the way is paved with stone steps and there are numerous stopping off points. After around 40 minutes, you reach a viewing deck that overlooks the smooth crescent of the bay with its chalky-white sand beach and azure sea. The viewpoint walk is a trail in itself, but I continued downhill into the bay, crossed the beach and entered the bush. At this point I walked west across the peninsula. The dense bush enveloped me; families of wallabies skittered through the undergrowth. To my delight, a kookaburra swooped down to retrieve a grub right next to my foot, before disappearing back into the trees. I came out of the bush at Hazard Beach, where the sand was more golden and the water incredibly calm. Following the sweep of the beach south, you can circumnavigate the peninsula, walking around its tip to finish back at Freycinet Lodge. Between April and September, bottlenose dolphins, southern right whales and humpback whales can sometimes be spotted from the shore. Tasmania is a year-round walking destination, but the weather is notoriously changeable. Fleeces and gloves are key for cold early mornings, although you’ll often strip down to a T-shirt by 10am. Sturdy walking boots are obligatory, as are water bottles or hydration packs. Many national parks don’t have places to refill water bottles, so make sure you bring enough water to keep you going.